The state of economy is quite volatile these days. Turning your whole investment portfolio to gold/silver may not be the smartest idea. But it never hurts to diversify and invest a bit in precious metals. If you are serious about investing in precious metals, you should also track your investment to make the right decisions at the right times. You can easily find the help you need with this app that we’re about to show you. It is called Precious Metal Spot, developed by the company Metal Silver & Co, and released on almost every platform we know. This is perhaps one of the best and most powerful financial analysis tools when it comes to gold, silver and platinum stock markets. Besides, it is simple, well-organized, and thus easy to use. 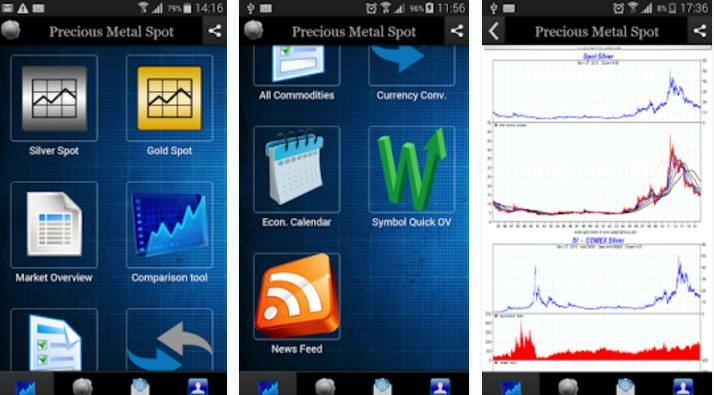 Among the many features in Precious Metal Spot you can find fully interactive and comparative charts for you to follow the precious metals’ stock markets and their main elements, you can convert any currency you need, keep track of your favorite stocks and shares, precious metal companies, mining industry leaders, etc. It also features gold and silver live covering, financial news feed, historical covering of precious metals, and many more. We are very confident that anyone who needs this kind of app will love this one. It can be downloaded from the following links, where it is completely free of charge!